No more smell of citrus, or your elbows in water! PolySupport™ is a material designed to solve one of the most intimidating problems in desktop FDM/FFF 3D printing. PolySupport™ generates support structures that can be easily removed by hand. 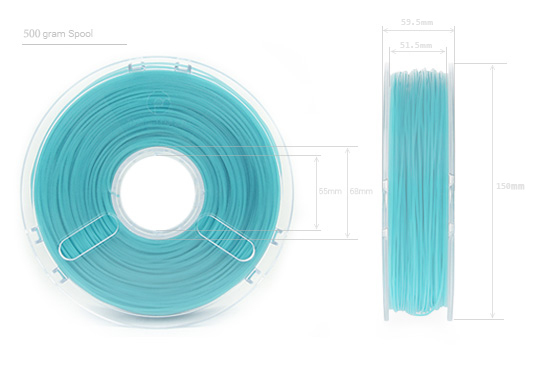 No More Hassle : PolySupport™ works just like your regular 3D printing filaments. Easy to print and store. No sensitivity to normal moisture or heat and no need to work with dangerous organic solvents. Freedom of Creation Redefined : How many times have you printed a part only to find out that either the print failed due to the lack of support, or how difficult it can be to remove the support without causing some damage to the part? We are glad to provide you with a new solution. PolySupport™ is a material designed specifically to generate support structures that are adequate to support the part being built, and yet extremely easy to remove afterwards. Single & Dual Extruders: PolySupport™ can be used on both dual and single-extrusion printers. It can be used either as a dedicated support material (dual-extrusion), or as both the modelling and support material (single-extrusion). In both cases the support structure can be easily removed. So no matter what printer you may have you can rely on PolySupport™ to support your creations. All our products work well with common build plate surfaces such as the blue tape, Kapton tape, glass, etc. However for the best user experience, we recommend that you use our materials with BuildTak, a build plate surface designed specifically for desktop FDM/FFF printers. Download our User Guide here to learn more about PolySupport™. In it you will find our recommended printer settings and general best practice guide when printing support on any desktop 3D Printer. You can purchase this material here.